Abstract: There's much to get excited about with Samsung's 52" LN52A850S1F LCD HDTV, commonly known as the 'A850'. 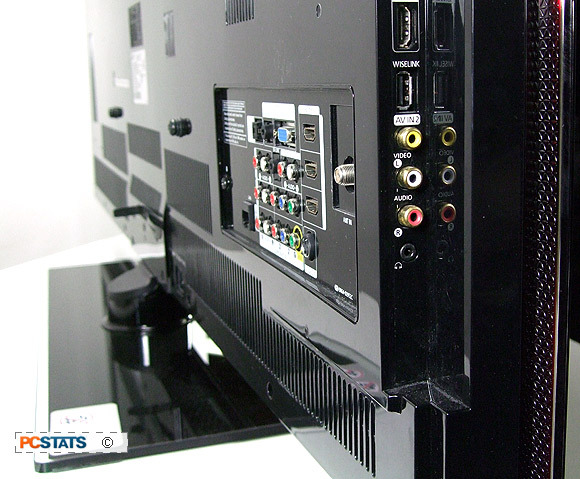 For starters this LCD HDTV ups the ante with the ability to play movies/music/pictures directly from a USB mass storage device or over a home network connection. There's much to get excited about with Samsung's 52" LN52A850S1F LCD HDTV, commonly known as the 'A850'. For starters this LCD HDTV ups the ante with the ability to play movies/music/pictures directly from a USB mass storage device or over a home network connection and it's screen is less than 2" thick, making it one of the thinnest large screen TV's out there. For those of you obsessed with specs and numbers, Samsung's A850-series stacks up like this: the 52" diagonal LCD screen boats a contrast ratio of 70,000:1 (dynamic), a brightness value of 500nits, industry standard viewing angles of 178/178 (horizontal/vertical), and a 4ms pixel refresh rate. The LN52A850S1F has a native resolution of 1920 x 1080 pixels and can maintain both 60Hz and 120Hz refresh rates. It's ATSC digital TV tuner picks up over the air signals without any additional hardware, and the screen boasts no fewer than four HDMI inputs. The overall design of the Samsung LN52A850S1F can be described in two words - "sleek" and "thin". In fact the display itself is just a shade under two inches wide, so when mounted on a wall it will only protrude as much as an equivalently sized painting. It looks spectacular in the office, taking it home and having it sit flush on a living room wall would look even better. The Samsung Wiselink content playback system has been significantly upgraded from the Samsung A650-series to a more versatile package dubbed Wiselink Pro. This upgraded system has the ability to access content off a USB thumb drive and use the HDTV's bulit-in hardware decoder to play compressed music, photos and movie files in a number of formats. Wiselink Pro can also connect via Ethernet to a media server (any PC with Samsung's PC Share Manager software) to stream content effortlessly. Samsung call this basic media streaming the Digital Living Network Alliance (DLNA). 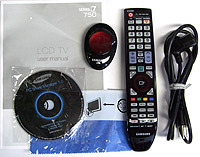 Includes: Remotes, batteries, manual, AC power cord, microfiber cleaning cloth, HDMI-cable. In other words, Wiselink Pro allows you to easily send movies, music and photos from a USB drive or PC directly to the HDTV over a standard home ethernet network. PCSTATS tested both Wiselink Pro configurations and this technology has some incredible potential for changing how you watch and access digital content. Like the Samsung A650-series before it, the Samsung LN52A850S1F supports Auto Motion Plus, a technology that enhances fast-moving video by interpolating extra frames, up-converting native 60Hz video to an effective 120Hz refresh rate. Essentially this corrects motion jittering in high-speed action sequences and panning shots. The Samsung LN52A850S1F has a new revision of the Auto Motion Plus interpolation processing system, so PCSTATS will be taking a closer look at it later on in this review. 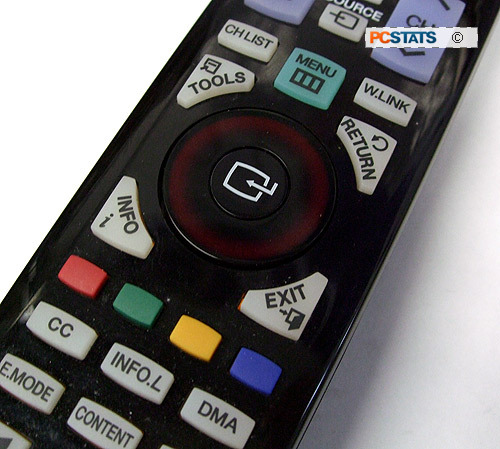 The remote comes with a scroll wheel that doubles as a directional pad. The iPod strikes again. 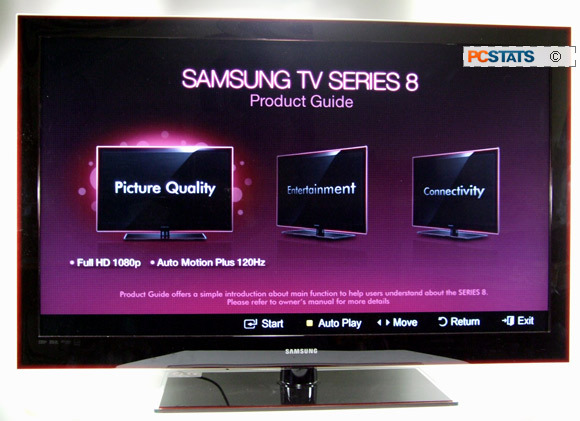 New to the Samsung A850-series of LCD HDTV displays is the Content Library, a wholly useless feature to most people. Infolink is back for those who would rather view real-time updates on stock information, news headlines (just from USA today) and local weather on their TV than start up the computer in the morning. Media inputs are one of the critical areas where HDTV's falter, too few and you're left without an easy way to connect your many media devices. Samsung's LN52A850S1F HDTV has a substantial set, including no less than four HDMI inputs. Like all modern TV's, the screen includes a built in HD Digital TV tuner for ATSC signals. The nice thing about broadcast HD television is that depending on your location, you can probably start watching HD TV without even paying for it. Side and rear I/O panels for a variety of media inputs and easily accessible inputs for portable devices like a game system, camera or USB drive. With its stand attached, the Samsung LN52A850S1F measures 49.7" wide, 30.7" tall and the screen 1.9" thick. The base swivels 30 degrees L/R and isn't too bad at 12.4" deep. Not including the bezel, the screen measures 45.5" inches across, 25.7 inches high (52" diagonal). The entire unit weighs a hefty 31kg or 68lbs. Expect the screen to draw upwards of 390W while on, less than 5W in standby. The LN52A850S1F is the largest in Samsung's 850-series, commanding a price of around $3010 CDN ($2340 USD, £1660 GBP), which is about average for an HDTV of this size and feature set. Next let's see just how many peripherals we can plug into this 52" display at the same time, but first let's go in for a closer look at this home theatre centerpiece. Pg 2. A850 - The Slimmest Panel Design?